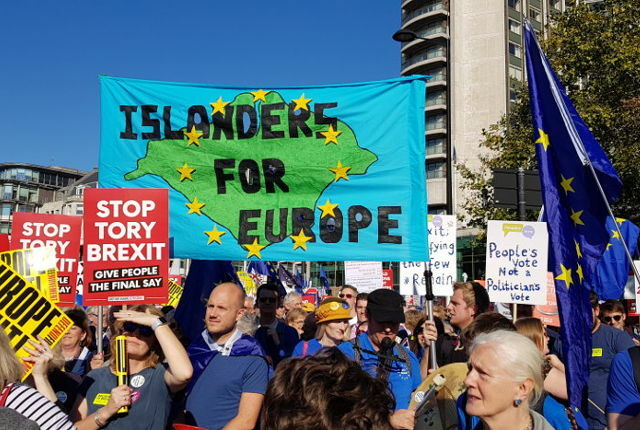 The number of Isle of Wight residents who have now signed the petition calling on the Government to Revoke Article 50 and remain in the EU has grown considerably since yesterday. OnTheWight has the latest update. The online petition calling for the Government to ‘Revoke Article 50 and remain in the EU’ has grown from just under a million signatures when we reported on it yesterday (Thursday), to now over 3.2m signatures. The percentage of Islanders who have signed the petition has also grown to 5,629 – making up 4.05% of the 139,105 constituents. The House of Commons Petitions Committee stated the rate of signatures being added to the petition was the fastest growing in the history of their petition site. Such has been the demand, that the number of signatures is no longer being updated in real time (meaning it could be higher than shown). You can check the numbers signing the petition on the official Government Website. 27 Comments on "Islanders signing Revoke Article 50 petition hits over 4%"
…or their recent use of sortition (to settle the previously divisive abortion in Ireland issue). …and by the way, I will also join the March! Thought you might be interested to know that, on his Twitter account, the Islands most brilliant and fantastic councillor Chris Whitehouse, claims to have personally added the names of Mogg, Farage and others. What he doesn’t explain is how he created unique email addresses for each individual. I know this may shock people, but I suspect Whitehouse is, once again, talking b*****ks. Made up rubbish with a dash of abuse. Sort of sums up the last three years really. Happy to say that the petition is well on it’s way to 4 and a half million. I wish those on the People’s Vote march today all the best, sadly, I am unable to attend. However, for those, who like myself are unable to attend, you can still make your views known to May by using the link I provide below. Let me know when there’s 50 million signatures. Can’t be long now. It isn’t as trivial as you might think to add fake signatures in bulk. See my previous post about the fraud detection used on the site. Consider this: if it was so easy to do, then why isn’t there such a large surge for a leave petition? Because there is no need. We’re leaving. That’s what the majority voted for. Everything else is just hot air and those seeking to undermine the will of the people. ha, ha ha. 5,457,750 for remain, one tenth of that for the no deal petition. Revoke s50 then have a 2nd (technically a third) referendum (when many of the frail elderly will have shuffled off this mortal coil in the happy knowledge that Britain is returning to the halcyon days of their youth – or middle age) and then a general election. Wow, hardly a landslide is it? Out of a population of? I will echo other people’s comments on this, not democratic at all.